The Bringing Hope, Building Lives Foundation opened the J. Hallingquest House during a ceremony Saturday, completing the transformation of an abandoned house into a place for the homeless struggling with addictions and for homeless veterans. KANSAS CITY, Mo. — The Bringing Hope, Building Lives Foundation opened the J. Hallingquest House during a ceremony Saturday, completing the transformation of an abandoned house into a place for the homeless struggling with addictions and for homeless veterans. "It's very exciting," Executive Director and President of Bringing Home, Building Lives Foundation Brandy Thornton said. "We are looking forward to the journey of actually helping those in need." The Foundation sought a way to assist the homeless population struggling with opioid abuse, many of who are veterans. "We wanted to alleviate any additional stressers that they may have, and we know that having a place for them to go to sleep at night would help in their success," Thornton said. With help from the community, the Foundation transformed the house from a source of blight to a beacon of hope. "I looked at this house and it was dilapited, it was ran down, it was not habitable and so I said God gave us this house to impact this community," Pastor Willie Thornton said. J. Hallingquest House has enough room for nine people, including an on-site manager and hope it become a resource that helps get the people on the right path to recovery. 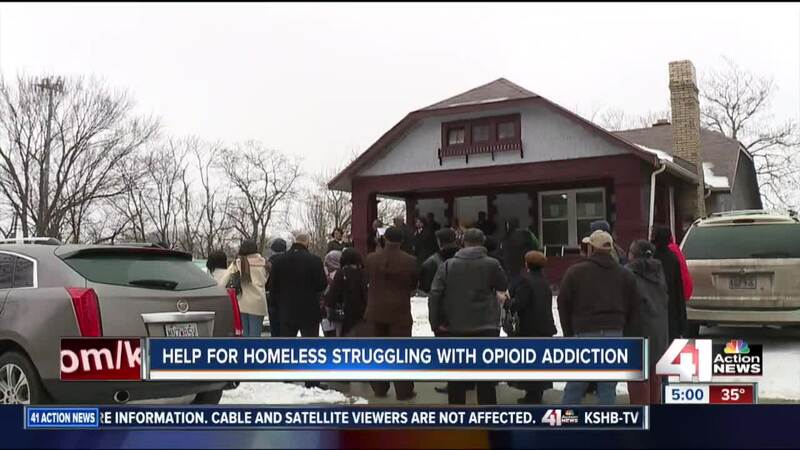 "If you can't deal with the homeless piece then it's hard to deal with the addiction piece, so we can give them a place to stay then we're able to help that addiction," Thornton said. There's a picture of James Hallingquest, for whom the house is named, on the living-room wall. "It's bittersweet," said Kelli Hallingquest, his widow. Hallingquest died unexpectedly in September 2017. "My husband had a very big personality," Kelli said. "Any event or anything that, if he was not in charge of it, he would think that he was." It was his vision, and the community embracing it, that led the J. Hallingquest House's founding. Now, they hope their hard work helps those in need. "You can't worry about the 99; you have to be concerned about the 1," Thonrton said. "If you can help just one person at a time, that will impact this community." Bringing Hope, Building Lives will work with Truman Medical Center and the city of Kansas City, Missouri, to identify individuals who will live there. The first residents are expected to move in by late February or early March. The Foundation is looking for additional ways the community can pitch in. Donations can be made via givelify.com or by mailing a check to Bringing Hope, Building Lives at 3551 Wabash Ave., Kansas City, MO 64109. Donations of toiletries, twin-sized bed sheets and mattress covers, and food can be dropped off from 9 a.m. to noon Monday through Friday or 5 to 6 p.m. on Wednesdays. To contact Bringing Hope, Building Lives send email to bringinghopekc@gmail.com .